Baked Three-Cheese Mac and Cheese, or what a plate of pure comfort food looks like. Creamy, rich, the best mac and cheese I have every tried. Hands up those of you who like macaroni and cheese! I personally love anything that has cheese in it, and if it is Cheddar cheese, even better. You can never go wrong with such dishes, they are simple enough to be cooked by anyone, yet so tasty. One would think a considerable amount of effort has gone into preparing them. Hardly any effort, I must assure you. When it comes to macaroni and cheese, simplicity is the word. 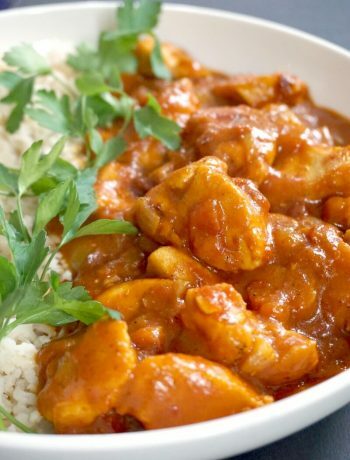 Fancy a night in, but feeling too guilty from your last take-away? Well, I admit, this may not be the healthiest dish I’ve ever cooked, but hey ho, one should be allowed to indulge from time to time. I see no harm in it, and then, it is way better than what stores have to offer in terms of comfort food. At least you know what goes into your food. Loads of cheese, and that’s just heaven. How do you make baked three-cheese mac and cheese? The creamy cheese sauce goes super well with any kind of pasta, including lasagna. It’s easy, it’s cheesy, it’s made with simple ingredients, and it’s super delicious. Can I make the mac and cheese without baking it? Of course, if in a rush, you can serve the dish straight after adding the cheesy sauce. It’s still super delicious. But I would leave out the breadcrumbs though, not need for them without baking. The three-cheese sauce is perfectly cooked at this stage, baking just take the dish to the very next level. What toppings can be added to the cheesy macaroni? Apart from the breadcrumbs, which give the dish a nice crunch when the cheese melts, you can add anything else that takes your fancy: cooked bacon, rotisserie chicken, or even some nice veggies. I have always preached that balance is the key to a happy life, and so it is. A bit of everything, and the body can only thrive. So, go on, enjoy your plate of macaroni and cheese! Ok, maybe not every single day, but as long as you also eat plenty of fruit and vegetables, you will be nice and healthy, trust me. If you’ve liked my BAKED THREE-CHEESE MAC AND CHEESE or any other recipe on the blog then don’t forget to rate the recipe and let me know how you got on in the comments below, I love hearing from you! You can also FOLLOW ME on FACEBOOK, and PINTEREST to see more delicious food and what I’m getting up to. A lovely baked three-cheese mac and cheese, or what a plate of pure comfort food looks like. Creamy, rich, the best mac and cheese I have every tried. Add the macaroni and boil on a medium heat until cooked. Any kind of pasta should do, it does not necessarily have to be macaroni. Remove from the heat, drain the water and set aside. In a saucepan, melt the butter and add the flour, whisk for a few seconds until you get a smooth paste, then add the milk and continue to whisk until it thickens into a sauce. Add the Red Leicester Cheese together with half of the Cheddar cheese and mix well. Preheat the oven to 200 degrees C (390 degrees Faherenheit). Transfer the cooked macaroni to an oven-proof dish, then pour over the cheesy sauce. Season well with ground black pepper. No need for salt, since the cheese is salty anyway. 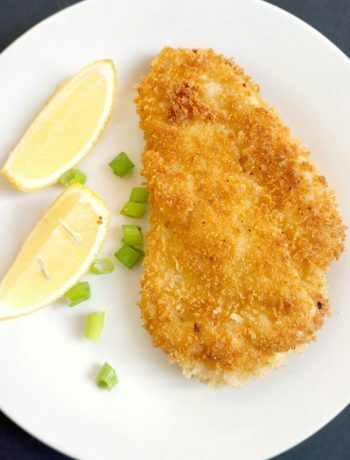 Sprinkle over breadcrumbs, then scatter over the remaining Cheddar cheese together with the mozzarella cheese. My vegetarian husband loves this meal, and your version looks lovely. We’ve never included breadcrumbs – which must add a nice crunchy texture. Thank you, Millie! The breadcrumbs do give a lovely crunch to the dish. Interesting, I’ve never tried this before! Such a wonderful classic, it’s difficult to resist a good macaroni and cheese dish, I’ll have to eat the whole thing! It’s our one of the favourite dish..comforting and delicious ! Oh yes please! Proper comfort food, this! I’d serve mine with a generous portion of chunky oven chips too. Carb overload! Who can ever say no to Mac & Cheese ? Your version looks quite similar to what I make too.. I do add my secret ingredient – dijon mustard! The addition of dijon mustard sounds fantastic. Thank you for stopping by! I love macaroni cheese, yours looks delicious! Totally agree with you that carbs are not the enemy, and moderation is all that is needed in what you choose to eat.